Today I am escaping from home. Today I am driving an hour North to spend the day with a friend. I'm going to run to my car @ 8 am driving as fast as possible.... I need a day away. I need a break from this house & the people who fill it. I can't take another moment of this insanity. I just can't. Hour trips to the gym aren't fixing my frustrations.. I'm gone long enough to calm down & then it's slapped in my face the moment I open my door. I'm aware that I'm allowing house guests to rule my home. I'm aware that I'm ready to throw them all out with a second thought. I'm aware that they have no where else to go. I'm stuck. I'm morally stuck on the dilemma at hand. I could list all the things that are bugging me but that wouldn't accomplish anything. I have had to rely on others before; so I can relate to the current circumstance. This rudeness that I've 'allowed' to take place in my home is unacceptable. I am now counting days until they leave my home.. I'm going an hour north. I'm going to visit a friend & her little girl. I'm escaping this situation & replacing it with something positive. A day of clarity can really help a person. I'm going to have lunch & shop at Hobby Lobby. I'm going to sit and relax with the nicest person I know. Surrounding yourself with a good hearted person can sometimes change you whole view. I'm hoping that's what happens. 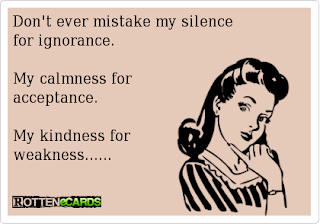 Otherwise my 'niceness' people mistake for 'weakness' is going to hit the floor & I pray they are already running when that happens. This Texas girl isn't so sweet when she's nice... "Bless their hearts". I can't fight it anymore. I'm breaking down & putting up my Christmas tree this coming weekend. Thanks to Mrs. Raven for posting instagram pictures of her tree already up! You can also check out her post about it ... I love Raven. Obsessed is more accurate. You rock Raven. Ok. That's all I got ladies. I hope you all are having a fabulous week. I can't wait to start checking out MORE Christmas things on pinterest. First I gotta get out of here.. it's an hour drive.. I can't contain my excitement anymore.